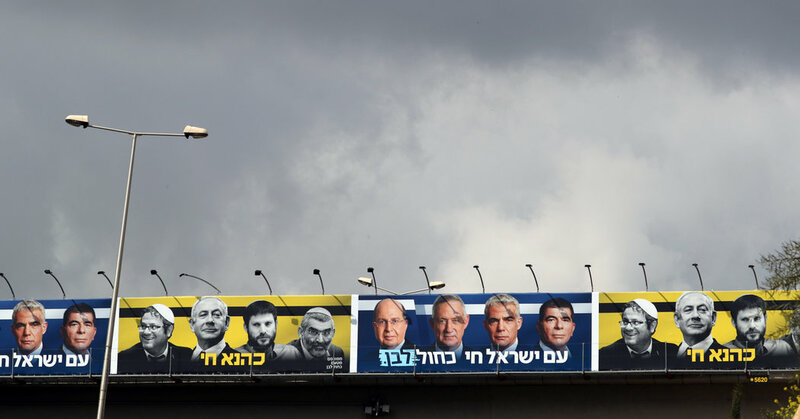 JERUSALEM – Israeli politics is not subtle. Threats are always existent, opponents are destroying everything voters hold dear, and the enemies aiming at residential neighborhoods from the Galilee to the Gaza periphery can only be scarcely more menacing than the supposed enemies within. With Prime Minister Benjamin Netanyahu polling neck and neck against Benny Gantz, a former army chief, riling up the base is as important as persuading anyone still on the fence. Right-wing parties talk tough about terrorists and liberal jurists; left-wing parties to sound like the most authentic peace-loving progressives; and centrists try to show that they are left and right of them are unreasonable. Just take a look at the commercials targeting voters on social media as the election next Tuesday draws near. They are in Hebrew and Arabic, but much of what is shown in the ads requires little or no translation. Let 's move from the political right to the left. Netanyahu to broker a deal that could allow one such splinter, the extremist anti-Arab party Otzma Yehudit, or Jewish Power into his next governing coalition. With absurdist satire, of course: An Israeli soldier is confronted with a knife-wielding Palestinian attack, but before he can shoot in self-defense, a military lawyer – tape measure in hand – intercedes to make sure he adheres to rules of engagement that Jewish Power is too restrictive. The New Right party emerged to advance the careers of Naftali Bennett, the education Minister, and Ayelet Shaked, the Justice Minister. Ms. Shaked has pushed the Israeli Supreme Court to the right, particularly over the settlement of the West Bank. She wants to keep her job and continue that work; Mr. Bennett wants to become defense minister. Their ads have often been lighthearted though some jokes have misfired. But their core messages can be seen in two more sober-minded videos. In one, Mr. Bennett aggressively sticks to Israel in interviews with Western and Arab journalists, showing he believes the best defense is a good offense. In another, Ms. Shaked plants outside and unspecified Jewish settlement outposts and replays familiar criticisms by settlers' opponents, which she dismisses as "background noise." Then she tells voters to "settle down – I still have a lot to do here." "Shaked will tame the High Court." The Russian immigrants who voted a lot for Avigdor Lieberman, the former defense minister, are not as potent a political force anymore, and polls show Mr. Lieberman's career and his party, Yisrael Beiteinu are in peril. To survive, he offers a blunt slogan: "Both right-wing and secular." Lieberman highlights his battle of the decades-old exemption from the military service for the ultra-Orthodox, or Haredim, whose rabbis have fought tooth and nail to preserve it. You don't need to understand the prayers to grasp that men with sidecurls in olive drab and with rifles at their feet, as Mr. Lieberman assures voters, "the worst nightmare" of the Haredi rabbis. Mr. Netanyahu's Likud party is putting out ads at the fastest clip, sometimes several a day, with President Trump frequently playing a supporting role. Mr. Gantz, the center-right candidate, is invariably belittled by a announcement announcer as "weak left." In this spot, titled "A change in priorities," the specifics are interesting enough. Mr. Gantz says he doesn't need any lectures from Mr. Netanyahu on security or strength. Mr. Lapid says the rise in the prescription drugs could have been offset by canceling the "superfluous plane" – an Israeli air force one – that Mr. Netanyahu "insisted on buying for himself." But the words are more important than the visuals: tough guys sitting around plotting how they are going to take down Mr. Netanyahu and fix what is ailing their country. That job has indeed been too much for those who have challenged Mr. Netanyahu in the past, but their message is that they can pull it off. The once-mighty Labor party has shrunk to a wisp of its old self, largely because of the rank and file's disenchantment with the party's current leader, Avi Gabbay. But Labor still has some moves: Netanyahu has been the most cutting and quickest to capitalize on the news. With Israelis from the Gaza border to the suburbs of Tel Aviv routinely running for cover, Labor is hammering Mr. Netanyahu – widely known by his nickname, "Bibi" – allows Hamas to get away with firing rockets into Israel. “No security. No peace, this ad says furiously, about images of blazing farmland and cowering children. "No reason to vote for Bibi." She points to gay rights and affordable housing, including the rise of the right wing, shows herself meeting President Mahmoud Abbas of the Palestinian Authority and embraces the "leftist" label, saying the only way Israel can reverse the path it is on is if people who think like her vote for a "strong left that will have confidence in itself." You do not need to know what is being said; suffice it to say that when you hear the word "Aravim," or Arabs, it has been used in ways that the people on the screen, whether or not Arab or Jew would find hurt. In this Arabic-language ad, Hadash-Taal, which would probably support in Gantz-led government, was his commercial against him, saying that 530 children were also killed in the Gaza. "Keep your voice clean," it pleads, by voting for Hadash-Taal – not for a man with "the blood of Gaza's children" on his hands.